On Tuesday, May 18, 2010 voters will decide whether to approve a temporary one-cent sales tax in a special election (the sales tax would repeal automatically on July 1, 2013). The revenue, generated over three years, would be apportioned between education and other vital services; two thirds of the proceeds would go toward education and the other third would fund health and human services and public safety. The Legislature could have chosen to increase revenues rather than put this to voters, but in Arizona a two-thirds majority is required to raise any tax and the votes aren't there, thanks to the 31 legislators who have signed an oath to Washington special interest lobbyist Grover Norquist, promising to never raise taxes in Arizona - no matter what the situation. Arizona Education Network is involved in a state wide discussion to support passage of the temporary sales tax to fund education. We will update you as soon as we know more. 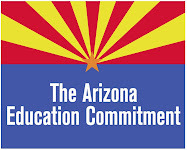 Public Education, The AZ Constitution & The No Tax Pledge! In another blow to fiscal responsibility, the House Ways and Means Committee voted to expand the private school tax credit program, tripling the amount of tax dollars that can be diverted from the general fund to private schools (HB 2664). Already, $55 million a year is diverted from the general fund to support private schools. The new limits would be $3,000 for a married couple, instead of $1,000, and $1,500 for an individual, up from $500. Remember that the public school tax credit limit is $400 per couple and $200 for an individual. Legislators were supposed to be addressing the concerns raised by two separate newspaper investigations in 2009 that found numerous problems with Arizona's private school tax credit program, Rigged Privilege: An Investigation into Arizona's Private School Tuition and The Tuition Tax Credit: Tuition-aid benefits wealthy families, raises worry. The House Ways and Means Committee also voted to extend the deadline for submitting tax credits to private schools to April 15 from the current Dec. 31 deadline. The tax-credit legislation now moves on to the full House. Arizona's Private School Tuition Tax-Credit Program: How We Got Here and Where are We Going? Tell Us Your Stories: How are education cuts affecting you? • Write a letter to the editor and make your opinion known about state funding of education and/or the proposed expansion of the private school tax credit program. • Forward this email to five friends, relatives, neighbors or colleagues and ask them to sign up to receive these updates. Education supporters can make a difference, but we must stay informed and take action.